This 2017 report,Integrating Ecosystem Services into National Forest Service Policy and Operations, was developed by the National Ecosystem Services Strategy Team. Snapshot : The Forest Service is poised to be a leader in the integration of ecosystem services concepts for forestland managers. This report demonstrates the breadth of opportunity available to the agency. The ecosystem services concept describes the many benefits people receive from nature and highlights the importance of managing public and private lands sustainably to ensure these benefits continue into the future. The National Ecosystem Services Strategy Team was chartered in 2013 to collaboratively develop national strategy and policy around ecosystem services and integrate them into U.S. Forest Service programs and operations. A product of this effort is a 2017 report published by the Forest Service’s Pacific Northwest Research Station. 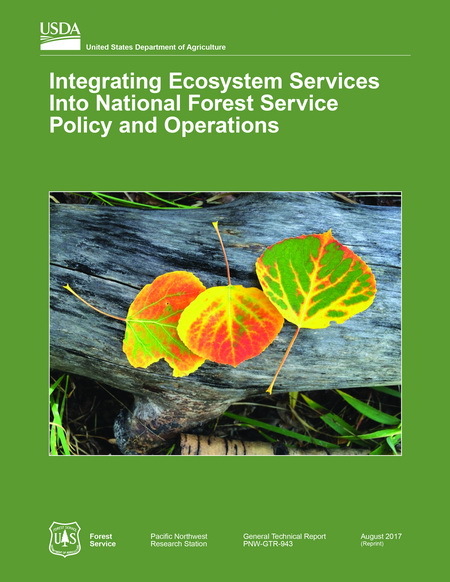 Integrating Ecosystem Services into National Forest Service Policy and Operations identifies focus areas for taking advantage of additional opportunities and needs, and summarizes some of the ongoing efforts to integrate ecosystem services into Forest Service policy and operations at national to local scales. It articulates existing Forest Service policy for the agency to consider a broad suite of services in decisionmaking and priority setting; to quantify and communicate in terms of benefits to people in measurement and reporting; and to connect providers and beneficiaries of ecosystem services through partnerships and investments.